CST cleaning solutions and powders have been used worldwide for over 40 years by hospitals, surgical centers, laboratories, clinics and veterinarians. CST cleaning solutions and powders have been used worldwide for over 40 years by hospitals, surgical centers, laboratories, clinics and veterinarians all over the world. Helpful representatives and detailed product sheets makes ordering what you need as simple as a phone call. We are also on the GSA Advantage for easy online government shopping. A clean sterile environment is just the beginning. You can also get solutions for washers, endoscopes and other equipment. Are you ready for a clean bill of health? 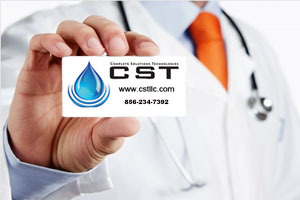 CST is a brand name and OEM manufacturer of commercial cleaners, detergents, sanitizers, lubricants and other chemical products, mostly ready-to-use products for customers worldwide. CST's products are used in medical, laboratory, veterinary, life science, pharmaceutical and industrial applications. CST products are for manual and automated cleaning and are used for all non-solvent cleaning applications. CST products range from enzymatic, acid/cleaners as well as neutral pH detergents and lubricants. They can be used to clean metals, mixed metals, aluminum, plastics, rubbers, glass, and a variety of mixed materials. CST's products come in powder, liquid or spray form with foam for manual and ultrasonic, or non-foaming for automatic washing. These products are used worldwide in all brands of washing machines, including low- and high-impingement washers, CIP- tunnel- and cart- and cage-washers, and specialty washers with validated processes. All products can be sold in almost any size and shape of packaging. As a service to our customers, we have a very qualified team of state-of-the-art equipped researchers available to not only keep up with the quality and uniqueness of our products, but also to create and formulate new or customized products. This is a service we are proud of, and it sets us aside from other manufacturers. Last but not least, we try to keep our cost as low as possible to maintain competitive prices. Complete Solutions Technologies is a group of medical professionals with many years of combined medical product development of specialty cleaners and protectants.